Trees hit by lightning don't always suffer serious damage. Lightning follows the part of the tree that contains the most water since the wetter part of the tree conducts electricity best. The intense heat from the lightning bolt vaporizes the moisture in the bolt's path. Steam exploding outward could shatter the trunk or barely scorch the bark, depending on the route the bolt followed. Lightning strikes often cause a spiraling scar that follows the trunk to ground. If the lightning bolt follows the phloem, a layer of growing tissue between bark and trunk that conducts sap, the moisture in that part of the phloem turns to steam. The heat either blisters the bark from the tree or rips it away explosively. When lightning follows a channel deeper in the tree's trunk, the wood beneath the bark suffers the most damage. Trees could split in half or shatter. A bolt that follows wet outer bark often does little visible damage. After any strike, the tree could die from extensive root injuries. Unless the initial damage felled the tree, the extent of the injury to it may not be visible for days or months. Trees near the tree that took the strike could also suffer damage since the bolt could jump from tree to tree. Lightning channels hidden beneath intact outer bark only show when the dead bark falls away. Branches in the top of the tree might die back weeks after the strike. 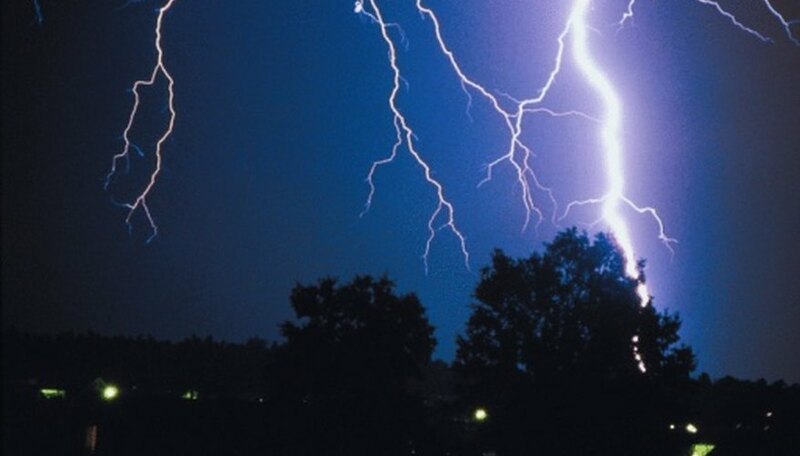 Waiting six months allows the real effects of the lightning strike to manifest, says the University of Minnesota Extension. Cracked trunks weaken the tree structurally and make it more likely to topple in high winds or when under load from snow or ice. Homeowners should prune any seriously damaged upper limbs, or hire an arborist to trim out damage too high to safely reach. Since heartwood isn't living tissue, splitting damage to the core of the trunk never heals. The tree may overgrow a surface lightning scar with healthy bark, but the streak of dead wood beneath still puts the tree at risk. The open wound of a lightning strike and the dead wood that follows increase the tree's vulnerability to fungal infection and insect attack. Painting the wound with pruning sealer actually increases the chances of disease. Giving the tree extra water after a strike by lightning helps it deal with the stress of the injury by making nutrients in the soil more available. Wounded trees in isolated locations deserve a chance to heal, but any severely damaged or diseased tree near parking areas or buildings endangers property and people and should be cut down. What Do I Wrap a Tree with When the Bark Has Been Scraped?